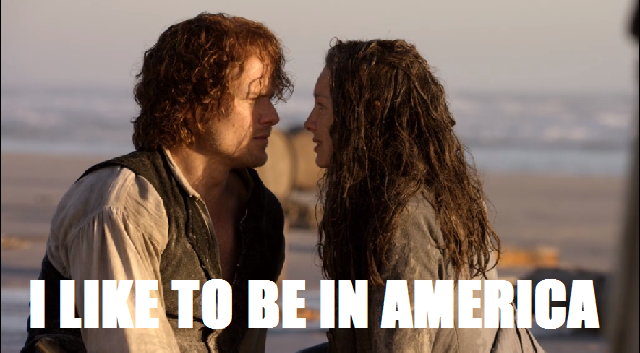 The time has arrived, Outlander fans. Thirteen episodes have gone by faster than you can say “James Alexander Malcom MacKenzie Fraser’ and we’ve embarked on that painfully long voyage we call Droughtlander. But I’m not going to dwell on how long we have to wait for the show to return. I’m just happy that we had an incredible third season that I can watch again and again (and again…and again) until we reunite with the gang in season four. Talk to me next summer and I may be telling a different story. Episode 313, “Eye of the Storm,” gave me everything I could have wanted out of a season finale. Action! Romance! Suspense! 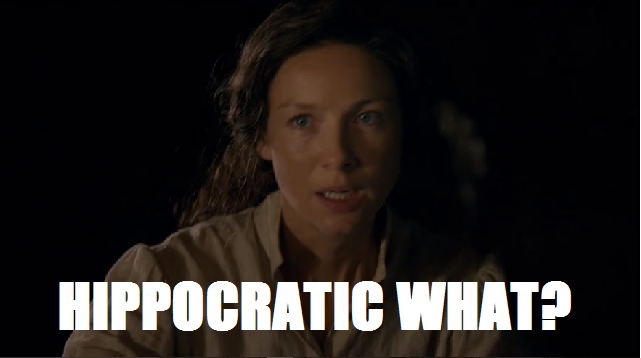 Feisty Claire! Crazy Geillis! Hunky Jamie! 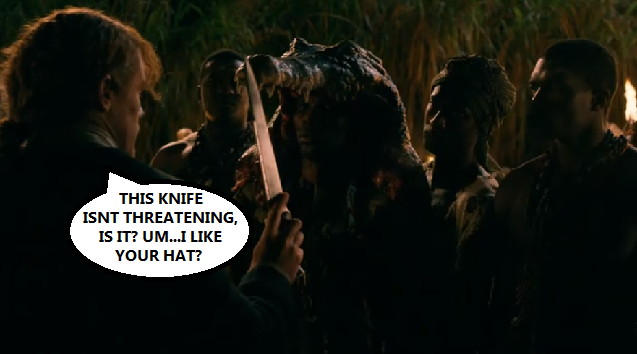 I mean heroic Jamie. Heroic Jamie. But also hunky Jamie. Sigh. Let’s set sail on the last (WEEP!) 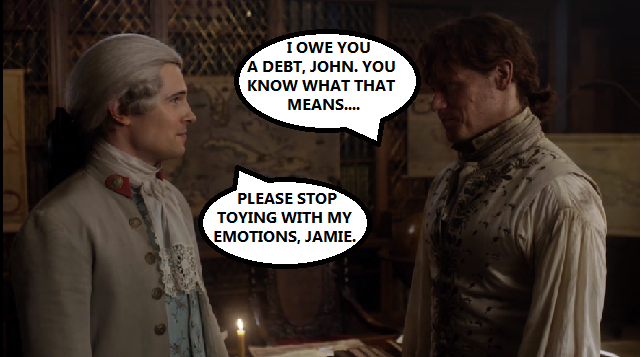 installment of Outlander Superlatives for season 3. I love Lord John always, but I think Governor of Jamaica Lord John is my favorite Lord John yet. I can’t wait to see more of him in the future! Side note: How lucky is Willie to have these two guys as fathers? Call me crazy, but I wouldn’t turn down a reboot of My Two Dads starring Lord John and JAMMF getting into zany parenting hijinks. Wee Ian is almost sacrificed. Geillis is trying to travel two hundred years to kill Brianna, who is probably out shopping for more great capes or maybe a new sweater for Roger. 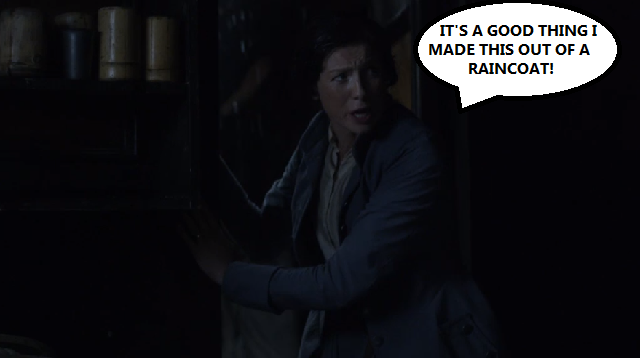 Claire almost gets torn to pieces by Geillis’s henchman. Jamie gets a gun pointed at him and a knife held to his throat, and then there’s that…I want to say chicken murdering ritual?…that Jamie and Claire stumble into. And all that is CAKE compared to the whole lot of them nearly dying at sea! I gotta tell you, it’s no wonder why Jamie hates boats so much. But for the record, James Cameron and everyone involved in the making of Titanic? THIS IS HOW TWO PEOPLE STAY AFLOAT. 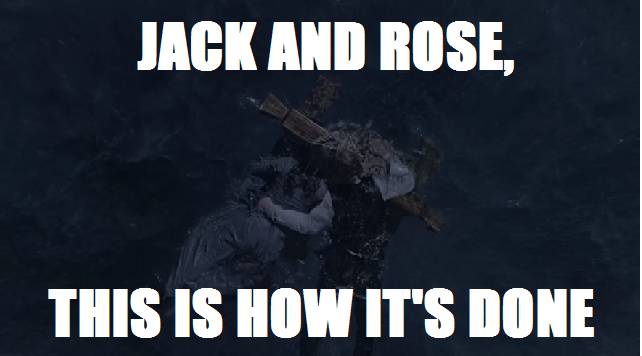 Jack could have fit on that door. Best Special Guest Star: AMERICA! The Frasers have made it to Georgia! They stumble upon this family that I’m pretty sure I’ve seen in Colonial Williamsburg! JAMIE MIGHT GET TO TRY A DELICIOUS PEACH! This is the perfect setup for season four. 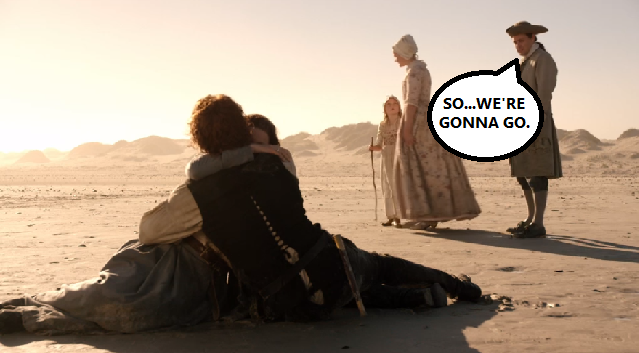 I’m sure things will be much easier for the Frasers in America. What could possibly happen? Oh, wait. There’s some sort of revolution coming up, isn’t there? This guy. He’s not only good for saving a life, he’s also great for a good nuzzle and a kiss. 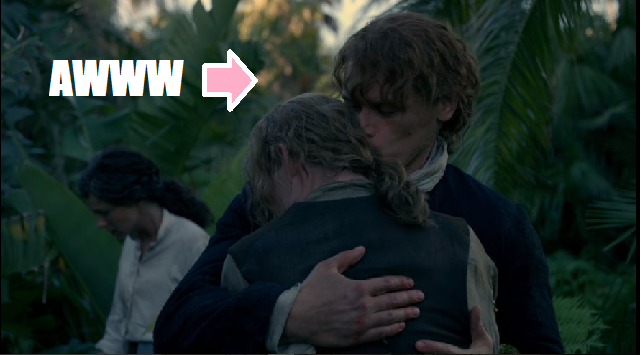 Also, I love any opportunity where we get to see JAMMF being fatherly because HE DIDN’T GET TO RAISE EITHER OF HIS CHILDREN AND IT BREAKS MY HEART EVERY TIME I THINK ABOUT IT. Someone give him a hug. Remember a few weeks ago when Claire was like, “I have to save this crazy man who tried to kill me because I took an oath!”? Well, that’s all out the window when her mama bear instinct kicks in. No crazy witch is going to kill her daughter. Toodles, Geillis. You brought crazy to a whole new level. P.S. I really like your robe. I don’t mean to be obvious here, but between the soap and the stubble and the high of rescuing his nephew and the sunlight filtering through those beautiful eyes? Me likey. 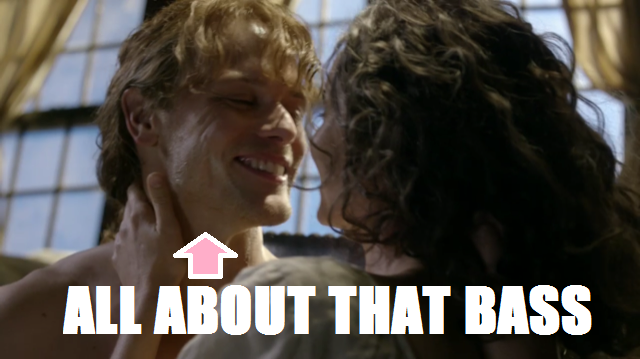 Also, I enjoy it when JAMMF talks about how much he likes big butts. I cannot lie. Am I the only one who has been singing songs from The Little Mermaid ever since this moment? 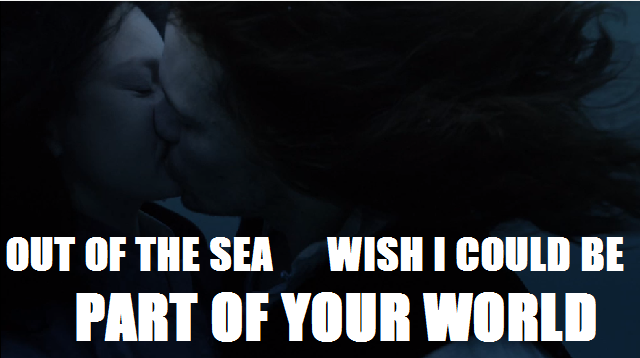 I mean, personally, the idea of underwater kissing sounds a little suffocating to me, and if my life were in danger, I’d rather make it to fresh air before making out, but maybe JAMMF read a fairy tale or two in his day and figured he’d better kiss the girl, you know? Whatever. 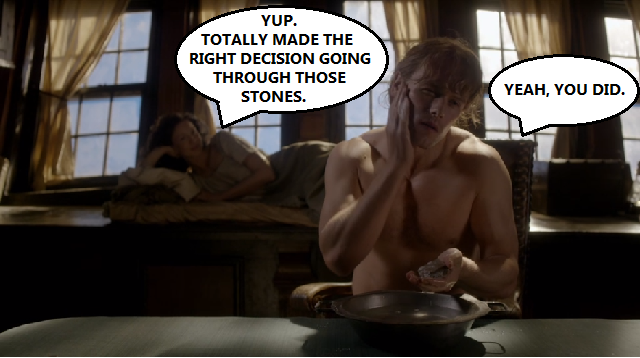 JAMMF can pull it off. 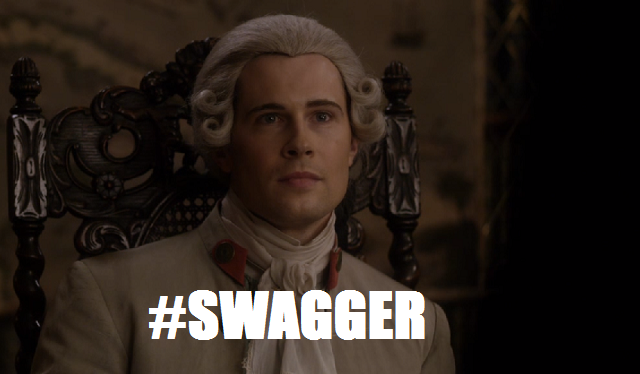 JAMMF can pull anything off. So, Fraser fanatics, what do you say? Can you believe how quickly this season went by? Will you be re-watching and/or re-reading on a constant loop until season four? 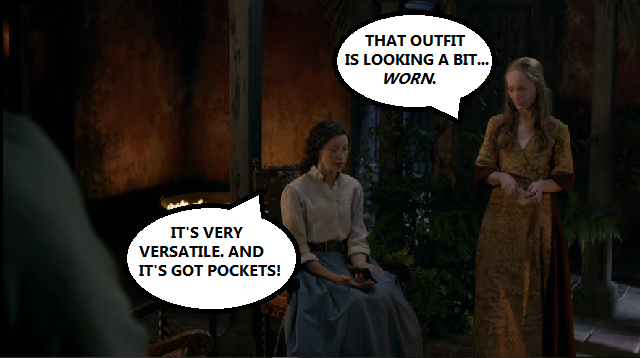 Do you think Claire will FINALLY wear something other than her batsuit? I think she’s gotten all the wear out of it she can. What were some of your favorite moments from season 3? For me, Jamie and Willie still take the cake. 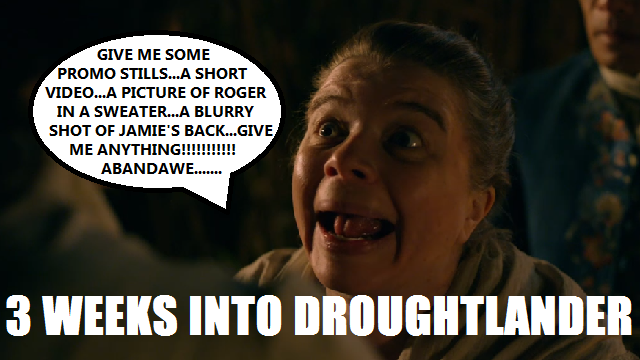 I *may* watch that episode in particular a few more times over the course of Droughtlander. And by a few I mean a few hundred.